From left: Rhiley DeBoer, Marilyn Chepil, Chelsea Collins and Cameron Mann. Jul. 4, 2017 3:10 p.m. The Ladies’ Auxiliary to Royal Canadian Legion Cloverdale Branch No. 6 awarded $19,000 to local community members, students and organizations at their third-annual donation ceremony on Wednesday, June 21, 2017. The LA gave $1,000 cheques to the Cloverdale fire hall for their Breakfast for Kids and Teen and Adult Outreach program, the Cloverdale Community Kitchen for their expansion renovations, the Volunteer Cancer Drivers Society, Zion Manor, the Surrey Hospital Foundation, and Willow House to support women recovering from addiction. Long-time Cloverdale Community Kitchen volunteer Dave Glastetter thanked the LA on behalf of the Pacific Community Church. He was the first of many to make a short speech thanking the Ladies’ Auxiliary for their work in the community. Surrey Hospital Foundation director Yolanda Bouwman said, “Legions and the community have played such a role in making the hospital possible” as she recognized that they wouldn’t have been able to break ground on Surrey Memorial Hospital 60 years ago without community support. As well as donations to Cloverdale and Surrey organizations, the LA awarded seven scholarships. Clayton Heights Secondary’s Allison Scott and Stephanie Boswell, Fleetwood Park Secondary’s Derron Johnson and Sarah (Felicity) Kim, and Lord Tweedsmuir Secondary’s Cameron Mann, Rhiley DeBoer and Chelsea Collins all received $1,000 scholarships. 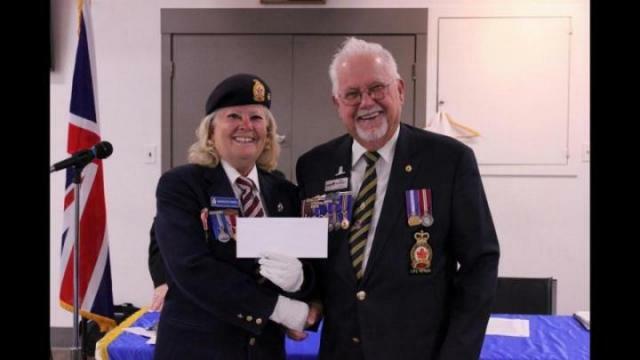 In a short presentation after the donation ceremony had concluded, the LA awarded the Cloverdale Legion $5,000, which branch president Barry Zuk accepted on behalf of the organization.